Fish–jellyfish associations were studied close to Barcelona (NW Mediterranean) during the summer period from 2008 to 2014. Jellyfish and their associate juvenile fish were collected, identified, counted, and measured. Fish behaviour was described by visual field observations and laboratory experiments were performed to determine the survival of the associated fish after being in contact with the jellyfish. In addition, the possible contribution of jellyfish to the dietary composition of the fish was assessed using a combination of biomarkers. Trachurus mediterraneus, Trachurus trachurus, and Caranx rhonchus were associated with the jellyfish Rhizostoma pulmo and Cotylorhiza tuberculata. Trachurus mediterraneus was the most frequent species and their size during the association ranged between 8.4 and 66 mm standard length. The size and number of T. mediterraneus were slightly correlated with the size of R. pulmo, but not with that of C. tuberculata, although more numerous fish were found swimming with C. tuberculata. Behaviour studies showed that juvenile fish swam around jellyfish and into their oral arms seeking shelter without suffering any pain. This survival capability was corroborated by experimental work in which all the specimens of T. mediterraneus survived after being in contact with both jellyfish species. Stable isotopes and fatty acids also revealed an important contribution of R. pulmo and C. tuberculata to T. mediterraneus diet. 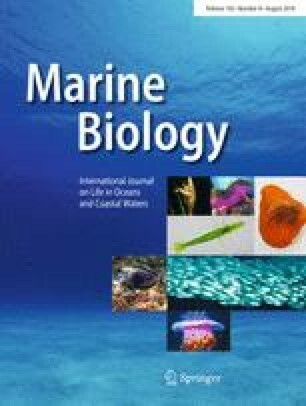 Defining better the associations between jellyfish and juvenile fish will help to understand the effects of the association on the survival and recruitment of fish species potentially ecologically and economically relevant. Reviewed by R. Masuda, A. Schiariti and undisclosed experts. We are especially grateful to Alejandro Olariaga, Giacomo Milisenda, Gastón Alurralde, and Raül Golo for their contribution to the fieldwork. We also specially thank Dr. Amit Lotan for his contribution to the experimental work with his knowledge and advice. We also thank Miriam Gentile for maintaining the jellyfish and fish in the experimental aquariums and Joan Mir for his help during the experimental work. We thank all reviewers for their accurate and constructive comments. This work was supported by the projects CTM2010-18874 and CTM2015-68543-R (Spanish Ministry of Economy and Competitiveness). UT was supported by a predoctoral fellowship of the FPI program (Spanish Ministry of Economy and Competitiveness). All applicable international, national, and/or institutional guidelines for the care and use of animals were followed. Fish were treated in agreement with the Spanish regulations (Royal Decree Act 53/2013) and the European legislation (2010/63 EU) concerning the protection of animals used for experimental and other scientific purposes. Animal experimental protocols were approved by the Animal Care and Use committee of the Generalitat de Catalunya under number DAAM8844. All steps were taken to reduce possible animal suffering.